​**Camp 5 may be full. Please check with us first. If you are already in Mulu National Park, then you might as well extend another day and spend 4 days in Mulu National Park to explore and challenge yourself to the Mulu Pinnacles climbing besides visiting the mulu caves like Lang's Cave, Cave of the Wind, Deer Cave and Clearwater Cave. Not forgetting also to visit the Penan village settlement. You can also enjoy seeing Bats as they stream out from Mulu Caves in the evening. Also an unforgettable Boat ride. 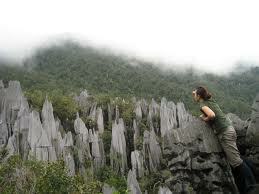 Climb and see the Mulu Pinnacles and enjoy the view from above. The Pinnacles in Mulu National Park Sarawak and the Mulu caves is a must visit. It will be an unforgettable experience to which you will be telling people about it after your visit. Join us on this exciting Mulu Pinnacles and Mulu caves tour in Sarawak. If you are looking for Mulu National Park Tour for 3D2N, please visit us by CLICKING HERE. *BENARAT LODGE occupancy will be quite full. BOOK EARLY! All transfer at Mulu, domestic airfare, meals as stated, boat fee, Nature guide, Park entry permit/fee, and Accomodations.